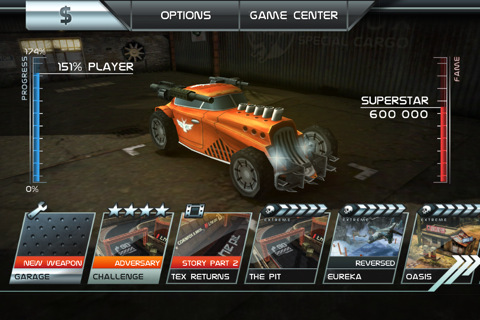 Death Rally, one of the app store’s newest demolition racing games, could very well be its best. Based on an original PC game and created by developers with almost two decades of experience, Death Rally is an intensely graphic renewal of a legacy. Open the app for the first time and you’re immediately trying in vain to outrun a line of cops. When they catch you (escaping them is part of the story and therefore unavoidable) you’re thrown in prison via a compelling couple of storied slides. From there the rest is history. The only thing you have to worry about in Death Rally is winning races, earning money, and mowing people down. For absolute beginners the experience that is Death Rally might prove more than overwhelming, but serious gamers will relish in the crisp graphics and intense soundscape that gives Death Rally its appeal. From a graphics perspective there’s little on iOS that stacks up, almost to the point of dizziness. 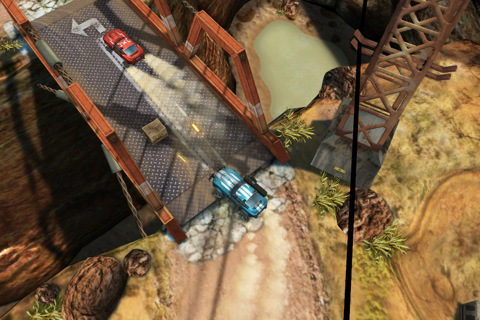 Although Death Rally is only compatible with the third generation iPods and up, as well as iPhone 3GS and higher, it’s universally designed for iPad. The bigger screen makes for an amazing gaming experience, but let’s cut to the chase on gameplay. 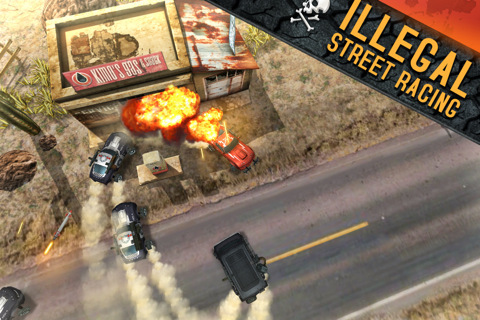 Death Rally is a top down racer with intense birds eye view graphics and an immense amount of detail. There’s a whole list of courses to select from, each with more detail than you can quite pick up on an iPhone (which can be somewhat problematic), but as long as you’re moving and shooting bullets at enemies you’re in the game. There’s no gas or break in Death Rally so you slide around the track at a constant clip controlling only your steering and gun firing. At first the game feels almost impossible to control, but just participating in races gives you cash which can be used to upgrade the handling for better control. 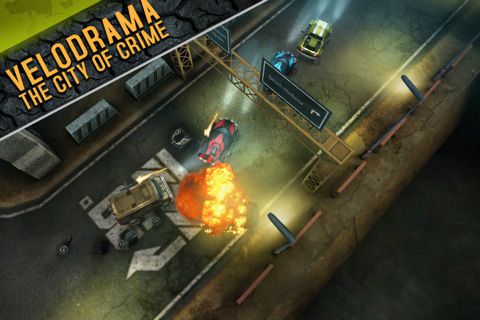 Players start with a basic beater buggy called Vagabond, but as you advance a whole collection of beaters are added so you can pick your demolition vehicle, paint it different colors, and even grab new weaponry. The fun in the game is in the aforementioned upgrades which can all be earned through achievements and cash. You can earn cash by picking up objects, beating opponents, finishing faster than before, or just tailgating opponents and littering their car with a steady stream of bullets. This variety in money making strategies adds a little something extra to Death Rally because you can go broke by beating everyone out at the finish line or tailgate opponents and watch their life drip away as you earn money by splattering their beaters with bullets. Either way it’s all about earning cash for upgrades in speed, handling and armor. It’s the professional graphics and highly sought after upgrades that gives Death Rally its true appeal. 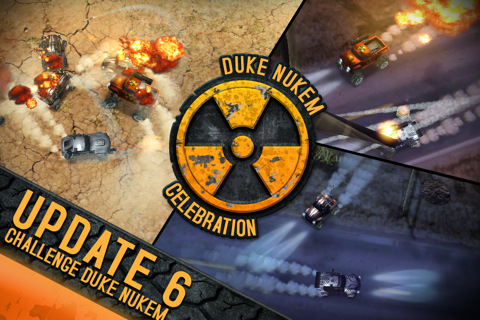 This is one of the few iPhone games that feels more like a console title, and that in and of itself is enough to guarantee more than a few devout drivers who would call this one of the best demolition racers in the app store. Bottom Line: Death Rally is a serious bloodbath racing game with just the right amount of intensity for serious gamers. Beginners though, might feel a little alienated by the hard nosed high difficulty gameplay.